In 1952, Patricia Highsmith, author of THE TALENTED MR RIPLEY, wrote a novel called The Price of Salt, about a young girl and an elder married woman who fall in love and try to make a life together. It was so controversial, not just in showing homosexual love but also not punishing the characters for it, that it could not be published under her name. Nonetheless, it was a success, maybe because it was the only place people could read about such things. But also, I think, because regardless of gender, it's a wonderfully authentic depiction of a coup de foudre, of falling in love and of trying to conform - which are all deeply relatable matters. Moreover, in Carol, Highsmith created a wonderfully charismatic character. Self-assured but sometimes nervous - tender but also uncompromising - a good mother but also self-aware enough to realise that she cannot be other than herself. Few of us would envy Carol's position as a woman divorcing her husband at a time when the odds were stacked against her, but many of us have come to admire her. By contrast, the young girl Therese Belivet is perhaps closer to how we feel ourselves - unsure, grasping at self-knowledge, acting on a whim, and unwilling to let go the tide. Over sixty years later, Todd Haynes has brought this novel to the screen - a director famous for his treatment of gay themes in cinema and for his affinity with the visual codes of 1950s cinema. He has cast Cate Blanchett and Rooney Mara as Carol and Therese and the result is superb. The actresses are more than up to the task of showing conflicting emotions, love and uncertainty, in a script by Phyllis Nagy that rightly often has them communicating more through glances and the unsaid than the verbalised. Mara won Best Actress at Cannes this year, and it's hard to see how they picked one actress over the other. As one would expect the costumes, hair and period details are perfect. And this isn't mere fetishism - in the novel a lot of how Therese becomes infatuated with Carol is down to memories of a scarf or gloves. But unlike FAR FROM HEAVEN, this isn't a movie filmed in Sirkian high tint colours. In fact, if anything it feels washed out, dismal grey, seen through fogged up windows or in dimly lit rooms. This is also right - the world isn't bright enough to hold Carol and Therese. It's claustrophobic in its banal dullness. 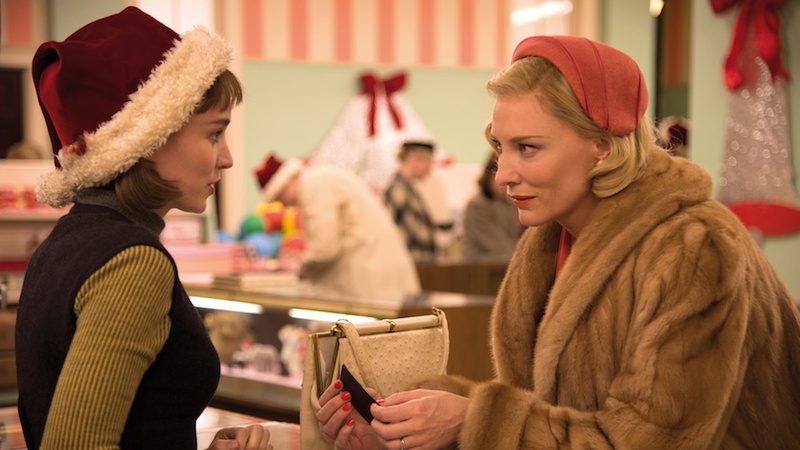 The only glamour and colour rests in Carol, and then eventually, a newly confident, Therese. It's hard to find anything to criticise in this almost perfect love story, but I suppose if I had to pick on anything it would be that Therese initially writes to Carol to return her gloves and not, as in the novel, just on a spontaneous and somewhat courageous whim. Simply to wish her well. That makes Therese less proactive than I would have liked. But otherwise, the transition from book to screen is faithful and what material has been lost (Mrs Robicheck, the letter left in the room) enhances the direct focus of the film. CAROL has a running time of 108 minutes. The film played Cannes 2015 where Rooney Mara won Best Actress and the film won the Queer Palm for "the first time a love story between two women was treated with the respect and significance of any other mainstream cinematic romance." It goes on release in the USA on November 20th, in the UK on November 27th, in the Netherlands on December 17th, in Sweden on December 25th, in Italy on January 1st, in Switzerland on January 7th, in France on January 13th and in Germany on January 14th.